Surfers Against Sewage – our work in 2016! Thanks to our incredible supporters we have had another great year in 2016. It has seen us develop our network of regional environmental volunteers, deliver more beach cleans than ever before, develop and distribute our beach clean box to coastal communities throughout the UK and most excitingly increase the value of our voluntary network to over £1 million for the first time! 85% – Reduction in plastic bag usage since the 5p carrier bag charge introduced, as called for in our successful “Break The Bag Habit” Campaign. 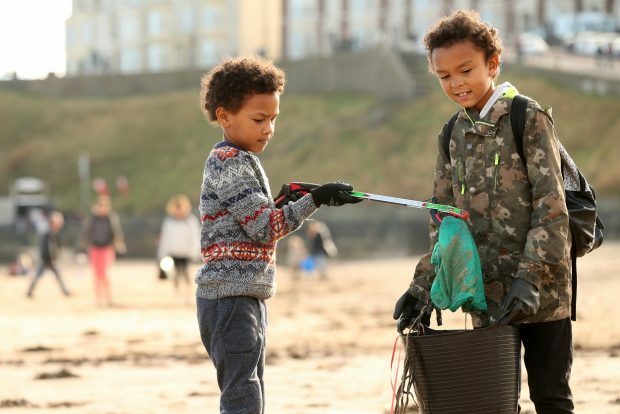 Our beach clean activities have continued to grow at a significant rate, this year we delivered 946 beach cleans, averaging 2 ½ every day of the year! Our unique way of working with volunteers means that we now deliver more beach cleans than any other charity in the UK and are widely recognised as one of the leading charities working in Europe in this area. We have expanded our network of Regional Reps from 75 to 125. This means that we now cover 125 coastal locations throughout the UK. Our regional volunteers continue to inspire us with their knowledge, dedication, commitment and ultimately with the amazing results they are achieving every day. We were delighted to launch our “Be the Change” education programme in 2016. Developed in partnership with Clean Cornwall and Cornwall Council we visited 21 schools and spoke to 2,912 school children. Excitingly we held a “Rubbish Day Out” event at the Eden Project in Cornwall, an amazing day! One really exciting development for SAS is that we have been able to employ a part time “Education Officer” for the first time, this will really help us to expand our education work in 2017 and we can’t wait to visit more schools than ever before! 1 ”Rubbish Day Out” held at the Eden Project, 1 “Rubbish Day Out” Live held online. Our amazing volunteers delivered education talks at 140 schools to more than 14,000 children! This summer we launched the “Beach Clean Box” with our network of regional environmental volunteers. These boxes are equipped with everything that coastal communities need to work in their community to tackle plastic pollution and other issues affecting our coastline. We have distributed 125 boxes through our network of volunteers! Surfers Against Sewage – All-Party Parliamentary Group. Our APPG (consisting of 23 MP’s) continues to provide SAS with an essential platform to raise serious environmental threats and marine conservation campaigns directly with politicians and senior civil servants. It also seeks cross-sectorial solutions to protect our coastal environment from marine litter, water pollution, habitat destruction and more. The recent water quality results have been incredibly positive. The dry summer coupled with infrastructure investment means that 2016 has seen widespread ‘Excellent’ bathing water results. This points to the success of our work over the past decade, calling for cleaner bathing waters through an enhanced and improved Bathing Water Directive designed to better protect beach goers and recreational water users. We continue to provide free, real time water quality alerts through our Safer Seas Service to all water users. Launch of our “Message in a bottle” Campaign calling for a Deposit Return Scheme. We have recently launched our “Message in a Bottle” campaign, calling for the introduction of a Deposit Return System for plastic bottles and other containers across the UK. A simple circular economy Deposit Return System could help almost eliminate plastic bottles and other containers littering our precious blue and green spaces, ensuring they are returned to the manufacturer for reuse or recycling, protecting our environment and saving a valuable resource. In the UK we use an estimated 38.5 million plastic bottles and 59 million cans every day in the UK. It has been an incredible year for Surfers Against Sewage and we couldn't have done it without the help of our supporters, Regional Reps, volunteers and the army of people that are part of the movement to protect oceans, waves, beaches and wildlife with us. Thank you all! It has truly been one of our biggest years ever. Tens of thousands of volunteers, 6 billion fewer plastic bags given out, better water quality results at even more beaches and more beach cleans than ever before. It also sets the scene for a massive 2017 where our priority focus will be on stopping the flow of single-use plastics to our oceans. « Essex Students Take Action to Keep Their Communities Litter Free!